January 8, 2015 k3fitLeave a Comment on 2015 is Here to Stay: January News! 2015 is Here to Stay: January News! Happy 2015!!! The dust (and snow) is settling from the holidays and I am hoping that you came out on top with your health to close out 2014! In December we focused on treating it like any other month and trying to battle against getting caught up in the craziness of the holiday scene. How did you do? What grade would you give yourself? I was happy as a clam to see a few clients who went out of town for vacation keeping up with their workout routines! I even got a few pictures from some sunny locations of family and group workouts, awesome! Great job to all who stayed on course through December! Here we are now in January where the gyms are crowded, spinach and kale are now popular at the grocery store, people are taking fat burners , juice cleanses and detoxes. Did you know that most people who make new year’s resolutions to lose weight give up on this by Jan 17th? I have never understood why people need a new year or a new year, week or Monday to “start over” I truly believe you can get going when you are ready to get going on a health journey. Get your body in gear by purchasing spinach and kale year round and do not fall into those money maker detoxes and cleanses because guess what? The body rebounds from all of that and gets on track with good old fashioned fruits and vegetables going into your body on a consistent basis. Nothing works without consistency…yes that means more than 2 days. So let’s say your goal is to start fresh this month, maybe you have already started. Great job for you! My goal is to keep you going past that dreaded Jan 17th mark. Book a consult with Fitness You Can Live with today if you need help and want to jump start your personal training or need help figuring out what to eat to get the results you want. Sometimes making that first step is the hardest step but with support and the desire to really change your life all things are possible. Please check out the growing naturals WINTER WEIGHT CHALLENGE which goes right through the end of January. Use the resources provided like this handy goal tracker that you can fill out. Or take advantage of this well put together fitness plan, whether you are at home, on the road or on vacation there are some great tips on here. As always follow along with me on all of my social media outlets like Instagram,Pinterest and Facebook which can all be accessed through www.fitnessyoucanlivewith.com to give you daily motivation,eating tips,recipes and TONS more! I will also be holding a big contest giveaway this month featuring some of my favorite products! So stay tuned and get your winter started the right way by putting you and your health at the top of your priority list. Need some breakfast inspiration? Start off your day right with this heart bowl of carrot cake oatmeal…warm and filling! Give your body a burst of whole food energy! 1 large carrot, shredded (about 1/2 cup) sometimes I even buy the baby food pouches of carrots. Works great! They have all kinds that mix great into oatmeal and shakes. Place the oats, milk, and water in a small pot and heat over medium until simmering. Turn down heat to low and cook for 3 minutes. 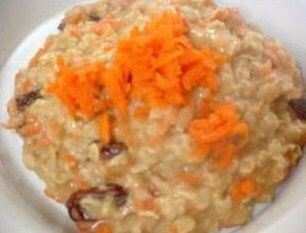 After the oats have simmered for 3 minutes, add the shredded carrot, raisins, and cinnamon to the pan. Cook for another 3 minutes. Cook to desired consistency then turn off heat and add the vanilla extract and sweetener.